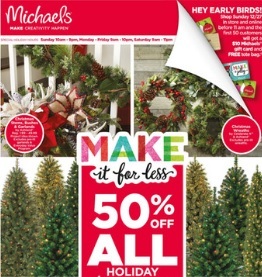 Featured offers in this Michaels weekly ad sale offer, valid April 21 – April 27, 2019: Christmas & Decorative Trims; Christmas Mini Wreath Floral Accents; Christmas Naturals; Christmas Pet Accessories; Christmas Party Table Décor; Christmas Party Supplies; The Elf on the Shelf: A Christmas Tradition; Collectible Santas; Christmas Bushes; Shatterproof & Glass Ornament Sets; Christmas Potted Arrangements; 18″ & 24″ Christmas Wreaths & 9 ft. Christmas Garland; Crafting Light Sets; Net & Icicle Lights; 100 ct. GE String-A-Long Light Sets; 100 ct. Basic Light Sets; GE & Celebrate It Danglers & Pathmarkers; Star Shower Magic Motion; GE & Celebrate It Lighted Tree Toppers; Gingerbread Cookie Decorating Kits; and more. Find all deals and offers in the latest Michaels Weekly Ad for your local store.